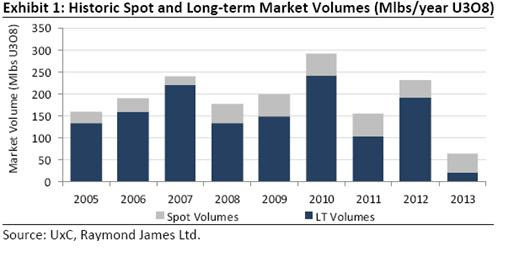 As outlined in our previous articles in November and December, we anticipate uranium prices to improve significantly in 2014 for a number of reasons. Today, the fundamentals for uranium and nuclear power generation are stronger than ever. More reactors are under construction, planned and proposed than before the Fukushima incident. For uranium prices to appreciate in the foreseeable future, one must look not only at the reactors under construction worldwide, but the ones coming online soon. China has 28 reactors under construction, yet 5 are ready to be connected to the grid this year. Japan has submitted applications for 17 reactors to be restarted, whereas analysts are expecting at least 6-8 reactors to be granted permission for restart in 2014. Both China and Japan are set to add vast amounts of demand back into the uranium market. The US is more dependent on foreign uranium supply than it is on foreign oil, as yearly consumption exceeds 23,000 tonnes of uranium, whereas domestic production accounts for less than 2,300 tonnes. In 1993, the US and Russia signed the ‘Megatons to Megawatts Program’, whereby USA bought 500 tonnes of Russian surplus high-enriched uranium (HEU) from nuclear disarmament and military stockpiles over 20 years, this having ended last year. These 500 tonnes of HEU, delivered in form of downblended LEU (low-enriched uranium) inside more than 200 vessels crossing the Atlantic, were supplying around 10% of all US electricity over the past 15 years representing about 12% of world uranium demand in recent years. These 500 tonnes of HEU had the equivalent of around 150,000 tonnes of natural uranium (177,000 tonnes U3O8, or 2.5 times annual world demand), of which 112,000 tonnes sold on the market. This is equivalent to an average of 8,850 tonnes U3O8 per year from global mines over the past 20 years. Already in 2011, USA and Russia signed a new contract for future supply, however the LEU will, from now on, come from Russia’s commercial enrichment activities rather than the downblending of weapons material. As per the new agreement, supplies to the USA are to be increased until 2015 to half the level supplied under the prior HEU program (option exists to supply up to the same level) and are expected to continue until 2022. However, according to the new contract, the feedstock for the LEU must come from sources other than Russian domestic mine supply. Hence, the replacement agreement is merely an enrichment services agreement and nothing more. The US is now called upon to source new uranium, deliver it to Russia for Russia to enrich, and then buy the resulting LEU. In essence, the replacement agreement does not help the US meet their need for sourcing supply in any way. It gets worse. While consuming some 23,000 tonnes U3O8 per year and domestically producing only 2,300 tonnes, the US is now on the hook for at least 20,700 tonnes every year, and it is anyone’s guess where that uranium will come from. The number is likely higher as the majority of US mine production is owned by the Russian government, and the Russians are within their rights to export it all back to Russia if they so desire. The supply side looks favorable for higher uranium prices as the extremely low prices have the side-effect that numerous mine development projects have been delayed, put on hold or outright canceled, tightening supply significantly for many years. The uranium market is facing a dramatic supply risk due to low market prices. The average marginal production costs for global mine supply stands at around $40/pound, yet spot prices trade at $35/pound today. 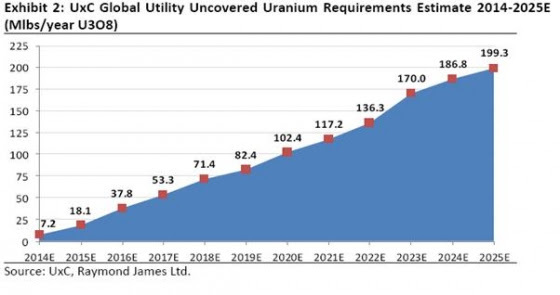 JPMorgan and others warned that the market must recover to $75-$80/pound to incentivize the development of new uranium projects. 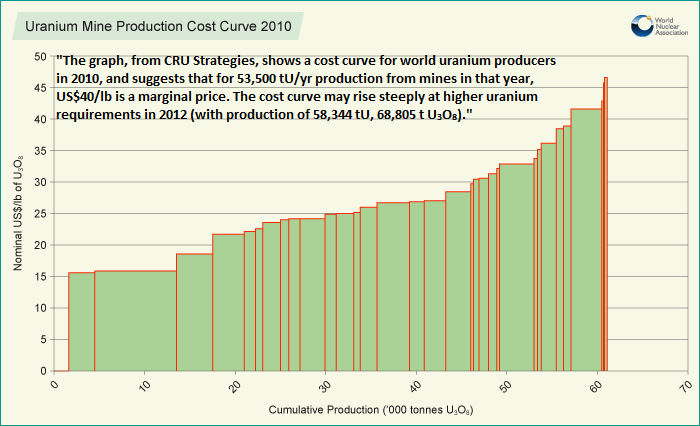 Why are uranium prices so low and why is a strong rebound on the horizon? Besides the large amounts of uranium inventories, another reason why uranium prices are so low is due to unprecedented low demand by nuclear power generation utilities. 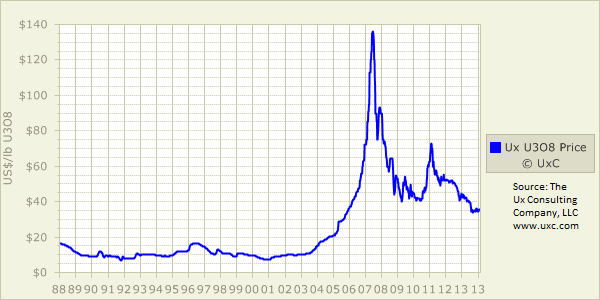 Normally, the lion’s share of physical uranium is transacted via long-term contracts. For nuclear utilities, the costs of uranium is somewhat negligible as it only makes up around 10% of total costs, hence supply security is much more important to them than the question if uranium costs $35 or $70 per pound. The capacities of producing mines are not sufficient to compensate future demand at current prices. In October 2013, Areva (second largest uranium producer after Cameco) warned its clients not to bet on low prices for much longer but to secure their long-term procurement until latest by 2015 – in order not being forced to compete with utilities from China, Russia, India or South-Korea. Until today, this warning remains unheard, and despite the World Nuclear Association forecasting a demand growth of 48% until 2023. Next page: Why are utilities behaving like this?